Every day, thousands of companies use paper forms to capture health and safety and general checklist data and then find that they still need to input this information into excel platforms to analyse, share and take action on the information received. And some companies find that they don’t have the time to carry out paper inspections (never mind data re-entry) on equipment and company assets and are therefore trapped in a cycle of reactive maintenance. CoreChex provides a better solution! CoreChex allows you to go beyond your existing paper forms and create meaningful and smart inspections with outcomes and actions to revolutionize your business. For example if the answer to a question is yes there is a defect subsequent ‘hidden’ questions can appear within the inspection asking for more evidence such as a photographic upload, error message, descption etc. Scheduled inspections are accessed via a smart phone or tablet and all data is automatically synchronised and available to view in a desktop environment in head office – no more waiting around for reports or chasing up staff for submissions. 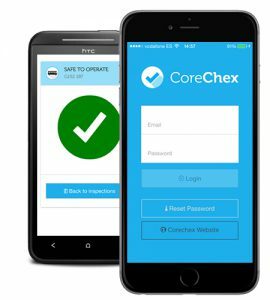 And CoreChex allows you to store all your vital inspection documents in the Cloud – no more filing with instant access should you ever need to revisit an inspection. Our easy to use mobile software system can be used for audits, checklists and inspections for equipment, vehicles, factories and yards to provide a instant view for health and safety and risk assessment purposes. Simply schedule a demo or sign up for a free trial and see how our mobile inspection app can work for your business by enabling staff members to fill out checklists and inspections online via their tablets and phones. Regardless of your sector CoreChex offers a solution. Check out how our Product page for more information on What is CoreChex or and find out how to save your business valuable time and money with our paperless inspection system.